The TWU (VIC/TAS Branch) recently alerted the Victorian Government to alarming Federal Government statistics concerning the transport industry – including the 184 people who died in 163 crashes involving heavy vehicles in the 12 months to 31 March this year and a Federal report linking low payments to crashes, speeding while fatigued and drug use. The chart (ABOVE) provides some interesting statistics drawn from a recent Branch survey of owner driver members. Over 44% of respondents work over 60 hours on a busy week and three-quarters over 40 hours a week – most of them barely make ends meet. 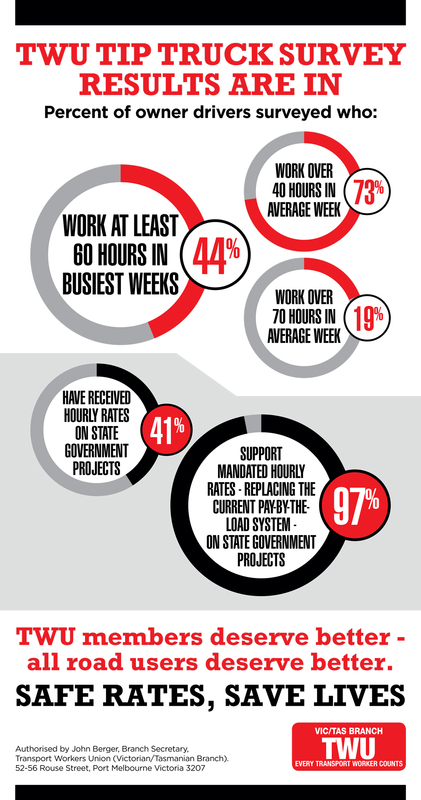 So when 97% say that hourly rates on State Government projects need to be mandated to replace the pay-by-the-load system – the powers that be need to stand up and pay attention. And we will make sure they do!